Welcome again to Mike Ossmann of Great Scott Gadgets! Mike will be attending Hamvention in Dayton OH this year. He’ll be at the TAPR booth and giving a talk about the HackRF. Chris will be at Maker Faire and SolidCon in San Francisco. Because of travel during Contextual Electronics, Chris has been working on the portalab concept discussed on previous shows (see picture above). Have you ever participated in a hardware hackathon? Did the winner have the most gear? Hackaday ran the hackathon at the Freescale Tech Forum in Dallas this year. The entries’ subject matter were a testament to the time crunch; the technical piece was well done for many of them. 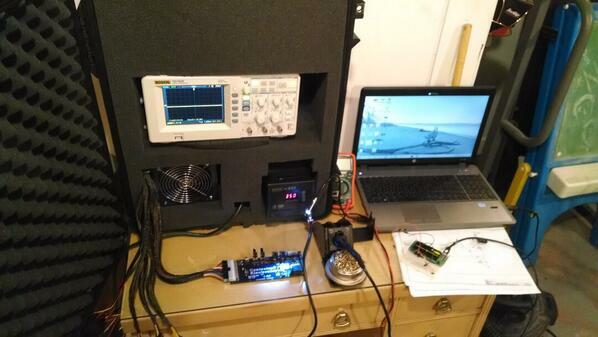 Mike continues development on the Daisho. It is an open source (HW & SW) USB 3.0 analyzer. It uses a custom core. The team bought a USB 3.0 analyzer from Lecroy. The chips and the tools still aren’t fully mature, so it’s not uncommon to find bugs. They have to compare across multiple platforms. Once again we discussed Rent’s Law (same as on the show with Dave Vandenbout); there is a correlation with pin count and logic size. Dave and Mike want the opposite ends of the spectrum. When asked about putting together an OSHW team, Mike said that he finds people at conferences and due to their contributions to the project before being hired. Many of the main contributors are now paid contractors. The funding for this project came from the DARPA cyber fast track program. Bunnie announced that the Novena project will also have a modular oscilloscope add-on possible for the extension header. You can still participate in their crowdfunding campaign! Mike also recently attended the Colorado OSHWA meeting in Boulder. He got to meet one of the few science savvy US House Reps (Congressman Polis), who also was interested in the trend of open source. The remainder of the US congress still is pretty clueless. Mike and Chris both use GitHub to capture changes in hardware. 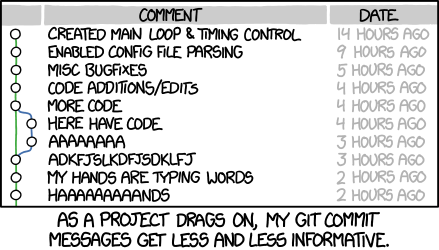 Chris is reminded of the XKCD where the commit comments get more and more ridiculous over time. You can tag official builds on GitHub with tags (example); Alternately, you can place your finished builds on a separate server, like KiCad. Dave still isn’t sold on KiCad, but we’ll wear him down. If you’re at Hamvention, keep an eye on Mike’s Twitter feed for a possible meet up. If you’re at Maker Faire, be sure to stop out to the annual #BringAHack dinner, this year at BJ’s restaurant in Foster City starting at 6 pm. Chris, I love tuvan throat singing. Have you listened to Gen Dos? It is wild, industrial genre, many overtones. Huun Huur tu is also very beautiful. Try listening to Sanskrit Storams next time you work, they are filled with wonderful algorithms behind the prose and grammar. I suggest the Sri Rudram. Always great to hear Mike as a guest. Very excited about receiving my HackRF. Sorry, Storams should read Stotrams / Stotra. Dropped the T on accident. Hey chris, for the boost converter for the atx power supply idea, you can buy 12v -> +/-25-45v power supplies designed for putting large linear audio amps into cars, I’m sure it would be trivially easy to float one of the secondaries. The fact that it’s bipolar on the output makes it even better. Could use that for an AB output stage or adjustable as the article above mentions. Might need some current limiting but this is a great start. Thanks!